Have you ever been tricked by a restaurant? I have. Many times actually. Though I wouldn’t say Crossroads, the all vegan Mediterranean restaurant duped me, I felt like I did. (I don’t have anything against those who are vegan, or those who have dietary needs of gluten free foods. I don’t want to offend anyone here, but this is more of my issue. I mean, if you are a vegan, I guess this is just the post for you. 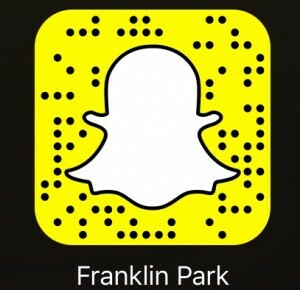 Trust me, there aren’t lots of posts like this for you. Anyways, back to my rant.) Not only was their Dine LA menu wrong online, but I had no idea going in that the restaurant was all vegan. I guess the latter part of that rant was my fault, but man oh man was I surprised. My logic was, a 5 course meal for $25 — that was a legit deal. To my surprise, they only offered a 4 course, and all were vegan dishes and portioned out smaller than normal. Honestly, I had reservation to The Spice Table, and blew it off for Crossroads — a lot more of a drive, but at the time, I thought it was worth it. The next night, I went to The Spice Table and my angst was all gone. 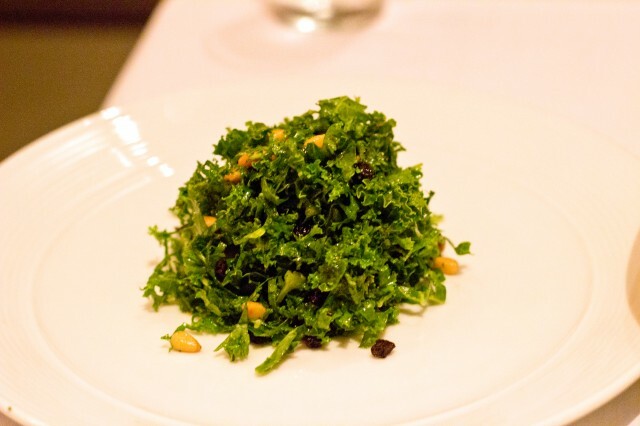 I love kale, and this kale salad was good, but I wish I had more of it. Just because it’s Dine LA, doesn’t mean you can just give a taste. 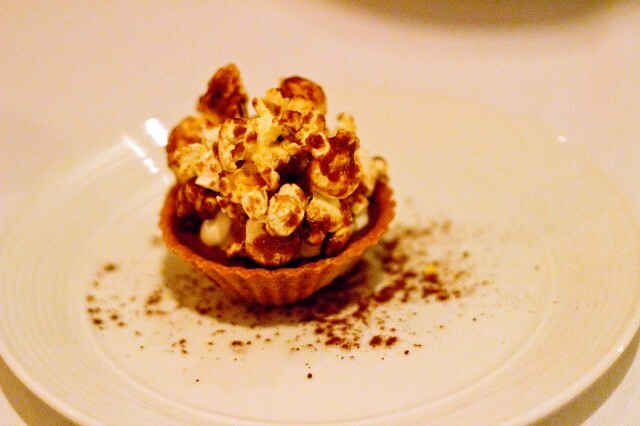 I like that the pine nuts gave a good crunch and currants gave some sweetness. With a lemon thyme vinaigrette, the salad was very intense. Each bite gave you a little shock and woke you up. The Pee wee potato salad was interesting. 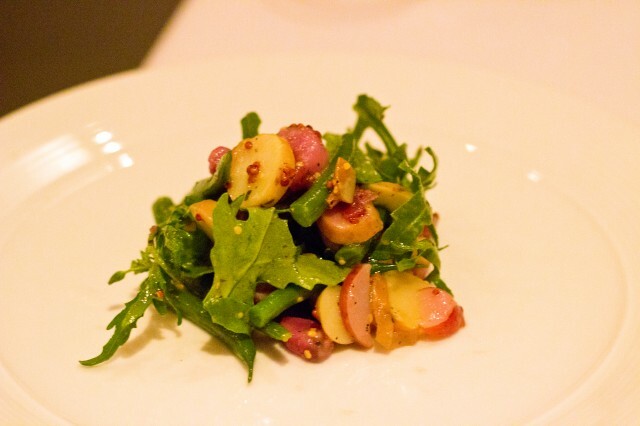 The Haricot Verts were crunchy and baby arugula gave it depth. The whole grain mustard was a good addition, but the tarragon vinaigrette was too obscure for me. I guess they needed to impart flavor somehow. With the appetizers being so small, by appetite just grew exponentially. If they aren’t going to give me a 5 course meal, I guess I was going to have to make it that way. We ordered the artichoke oysters which were off the Dine LA menu. These were kind of cool to look at and cleverly plated. The artichoke acted as the oyster shell. 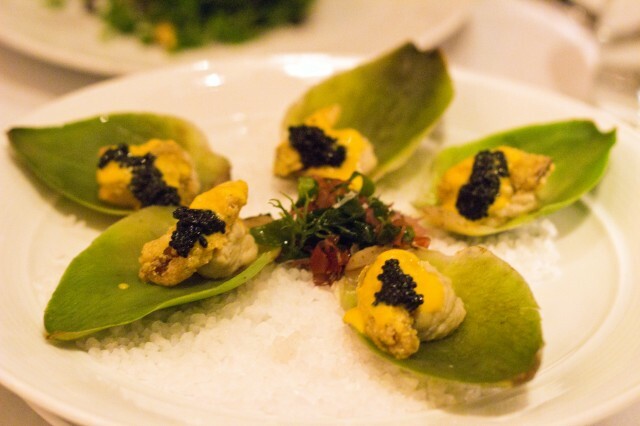 A fried oyster mushroom sat on op of artichoke puree and a yellow tomato béarnaise sauce. On top sat kelp caviar. I mean, the whole thing looked better than it tasted, but it was interesting to see how the chef creatively created something oyster-like without any. 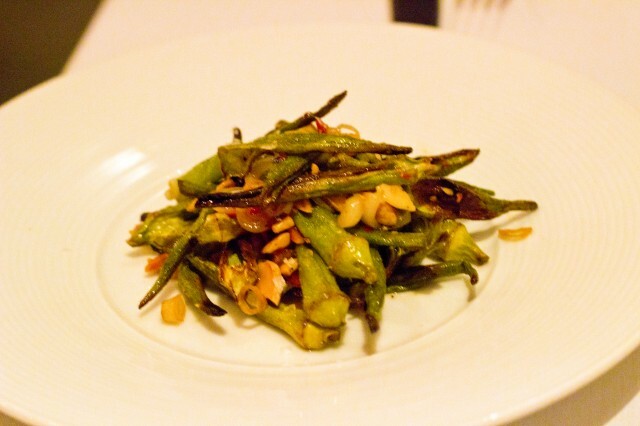 The wood roasted okra was my favorite of all the things I ate that night. First off, I want to say that okra is actually my top 5 worst vegetables on my list. However, the way they prepared it was magical. It had a nice crunch to it and the sweetness from the calabrese peppers and tart from pickled ramps and Spanish sherry vinegar was an amazing mixture. The crunch from the Marcona almonds finished everything off. 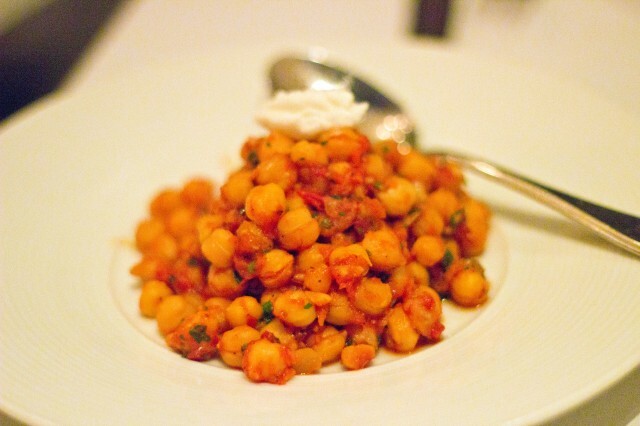 The spiced chickpeas was a bit uninspired. The oven dried tomatoes and parsley had a nice spice to it. I liked the garlic whip on top of the dish. It was creamy and had lots of flavor, and the spice was an added kick that helped as much as it could. At the end of the day though, I felt like I was eating tomato sauce mixed in with chickpeas. This needed cheese or some kind of cream sauce, which I guess is not allowed. 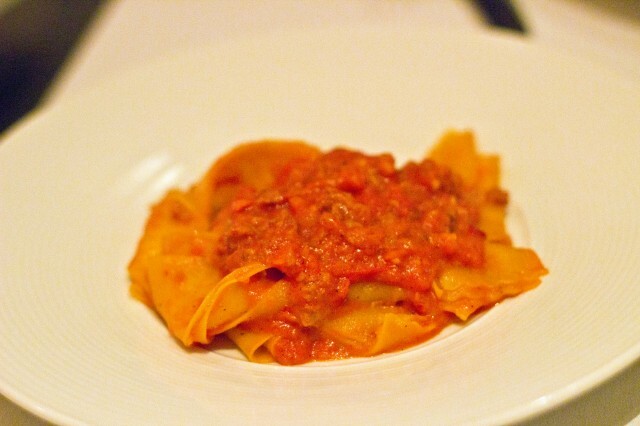 I don’t know how Pappardelle Bolognese is on the menu at a Mediterranean restaurant, but it is, randomly. The 3ish noodles of pappardelle were chewy and over cooked. The bolognese was just tomato sauce. That is all. 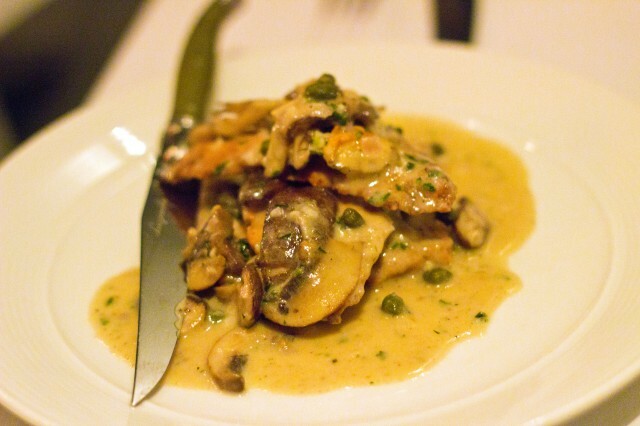 The scaloppini piccata was pretty good for being meatless. The picatta was a dredged and fried slices of protein “meat.” The piccata was zesty and flavorful. The caper and lemon sauce mixture was a bit too sour, but the creamy sauce and the meatless meat was a good combination. Again though, this was the main dish, but there was too little of it. The chocolate ganache tartlet was surprisingly awesome. I like eating the mildly sweet spiced caramel popcorn on top. The mascarpone and chocolate went nicely together. The tarlet with the chocolate ganache was rich and imparted deep flavor. Their sorbet was also good. The cucumber lime made a nice balance of not too sweet flavors. 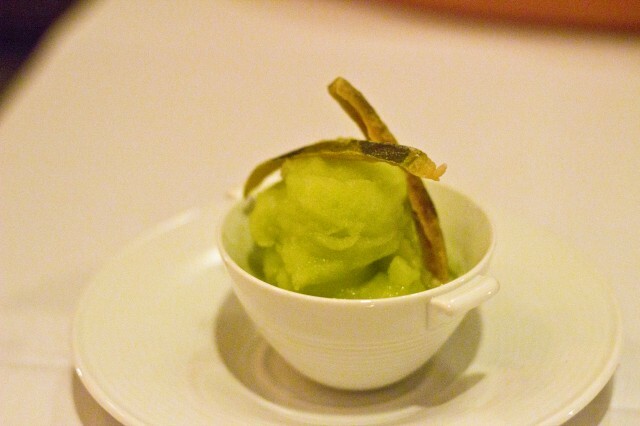 The cucumber essence really shined in this sorbet. The candied watermelon rind on top was subtly sweet and delicious. At the end of the day, I can’t be mad. Though they did switch up the menu last minute, I chose the restaurant on my own. 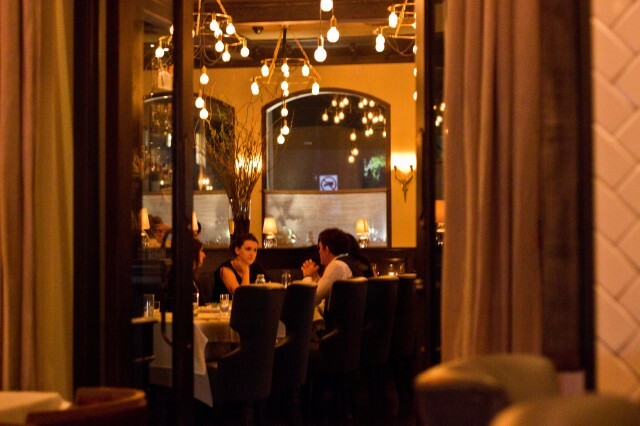 The restaurant inside is exquisite — classy chic with a bit of comfortable. The servers and staff were all nice, though it was a little slow that night. Honestly, this may be a rant from a voracious meat lover, but any vegan or anyone staying away from gluten could appreciate this restaurant. This just wasn’t for me.